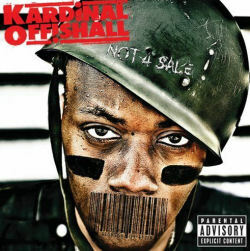 RapReviews.com Feature for October 7, 2008 - Kardinal Offishall's "Not 4 Sale"
Back in 2001 Kardinal Offishall arose from the streets of the T-dot-O (Toronto) as an ambassador of the Canadian hip-hop scene riding on the steam of his first US release "Quest for Fire: Firestarter, Vol. 1." The album was a hit and miss affair but certainly revealed to the world a fresh new dancehall-infused hip-hop sound and an undeniable talent in Kardi. He was destined for greatness. But as the story goes with so many in the industry, Kardi's second major release was shelved after label problems--MCA Records folded in 2003--leaving this emcee without recording home. Now, some seven years after his last official release, Offishall has been taken under the wing of R&B crooner Akon, but the question remains as to whether he can pick up where he left off. Say kid, can I get a witness?" There is no reason to expound upon why this song is a success because it clearly has all of the necessary elements of a single between the fantastic hook and uptempo head-nodding beat. Another big difference between his first major outing is now Kardinal Offishall has a bunch of A-listers along for the ride. "Set It Off" features the coke-slanging antics of The Clipse over an pulsating low bass production. Pusha T and Malice represent with a multitude of clever lines like, "Me and my niggas call the coupe Jekyll and Hyde/ ‘Cuz the roof's on and off like they in and out of their minds." It becomes immediately clear that they have come in top form, but many expectations are not reached. T-Pain, for instance, simplifies his auto-tune style too drastically on "Go Home With You," though it remains hypnotic, whereas Estelle's appearance on "Due Me A Favour" is tiresome, repetitive, and is only really saved by the completely unrelated accapella at the end where the featured artist drops some knowledge. Therein lies the problem for much of "Not 4 Sale." It seems that Kardinal and company too often swing for home runs but end up with not much to show for it, as the creative elements fail to mesh in ways they are meant to. "Quest for Fire" was more well-rounded in covering social issues ("Man By Choice") and the ghetto lifestyle ("G-Walkin'; "UR Ghetto 2002") . Most of the production is pretty tight throughout. "Gimme Some" featuring The Dream sounds like a b-side of Timberlake's "My Love" and the driving hollow drums of "Numba One (Tide is High)" featuring Rhianna is more than serviceable. The latter seems like a likely candidate as a follow-up single to "Dangerous." However, some of the dance-hall joints ("Burnt"; "Lighter") seem like they are missing something and the self-produced cuts are also lacking much depth behind the boards ("Family Tree"; "Bad Like We Bad" and "Go Home With You"). There is only one time that Kardinal abandons seeking popular appeal through a contemporary sound . And that is with "Nina" a reggae-inspired joint that is decidedly sweeter and understated than what most of "Not 4 Sale" offers. Though the song is well-structured and appealing in it's own right, it feels completely out of place on this commercially appetizing LP. The real highlight of the disc comes on the strength on the smashing Nottz produced "Ill Eagle Alien," (or illegal alien) that has a nicely implemented science fiction whistle that comes in on the backdrop. Here he states his rude boy status with conviction, not afraid to represent the influence that his Jamaican immigrant parents had on him. Certain lines on this separate him from the norm when he says, "I would rather have a real home sitting on an acre/Than owing about a hundred grand to my jewelry maker." While this CD will keep you occupied for a couple of weeks thanks to a few key tracks, the lesson learned from "Not 4 Sale" is that you cannot simply force an album of stellar singles. Sometimes you have what seems to be the perfect formula of good beats and a great talent behind the mic, yet they just don't mix together into the right blend. The biggest issue is the lack of any material truly introspective or meaningful, making the title here tragically ironic. Hopefully Kardinal will reach a level of popularity on this album that will allow him to have more creative control on future endeavors.